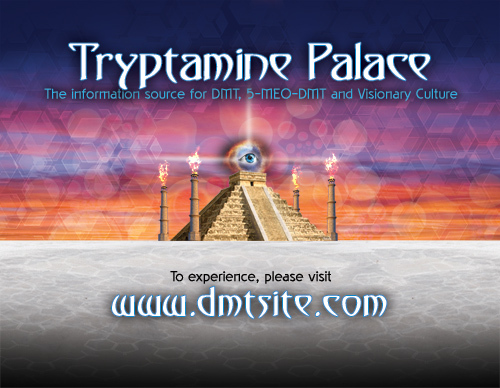 Welcome to the Tryptamine Palace – the web-based information portal dedicated to the endogenous psychedelic entheogens, DMT (dimethyltryptamine), 5-MeO-DMT (5-methoxy-dimethyltryptamine), their animal and plant-analogues, (including ayahuasca, yopo, ebené, and Bufo alvarius toad venom), and their influence on the emerging global Visionary Culture. It is also intended as a entheogenic blog and 'e-companion' for the book "Tryptamine Palace: 5-MeO-DMT and the Sonoran Desert Toad' by James Oroc. The answer is never the answer. What’s really interesting is the mystery. If you seek the mystery instead of the answer, you’ll always be seeking. I’ve never seen anybody really find the answer, but they think they have. So they stop thinking. But the job is to seek mystery, evoke mystery, plant a garden in which strange plants grow and mysteries bloom. The need for mystery is greater than the need for an answer. Ken Kesey, “The Art of Fiction CXXXVI”, The Paris Review, 1994.